Our Hungry Hungry Hippo Inflatable rental, aka, the Hippo chow down rental is a top inflatable rental this year! This inflatable game is just like the old classic game hungry hungry hippos! 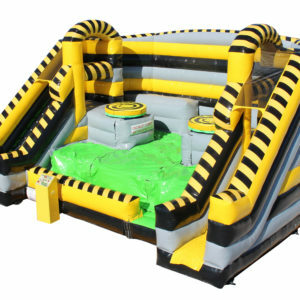 This is A & S Play Zone’s newest interactive inflatable rental. This inflatable game offers great graphics for a stunning visual. Great for to college event, team building event, after prom or graduation party. The Hungry Hungry Hippos Adult Game is the Cincinnati, Dayton And Columbus’s latest 4-player bungee tug-o-war style game that involves speed, strength and fun. Hippo Chow Down rental is super fun and easy to play. Just imagine hungry hippo and you are the hippo. Not only is this game fun to play, it’s just as fun to watch. Object of hippo chow down rental:First the game starts. Second each of the 4 players starts from their back wall and races to the pond of balls in the center of the game to retrieve as many balls as possible. Then they return them to the mesh bag at their starting wall. Finally once all of the balls are chow’d down, the player with the most balls in their bag is the winner. Simple as that! Therefore the hippo chow down rental is sure to be a big hit at your next event. If you are looking for other life size games we also offer inflatable Simon rental, life size Jenga Rental, life size Kerplunk rental and others. Call A & S Party Rental today at 513-315-9110 or 937-885-5454 and let our friendly staff help start planning your next big event! Check us out on Facebook to see our latest pictures and videos. Also follow us on Twitter to see what we are up to. In addition we also have a YouTube Channel where we post tons of cool videos. A & S Play Zone is know to bring out the fun in everyone so call today before it’s too late!